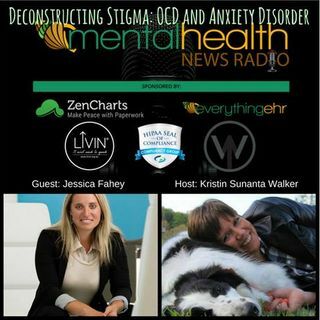 Another terrific contributor to McLean Hospital's mental health inititative Deconstructing Stigma, Jessica Fahey joins our host Kristin Walker to talk about OCD and Anxiety Disorder. Jessica is the picture of success. She manages more than 25 employees that oversee lab space where scientists work on lifesaving discoveries. She recently married her love, an army veteran of the Afghanistan war turned police officer. They bought a house and rounded out their family with a new puggle puppy (a ... Más informaciones pug/beagle mix). Jessica accomplished all this with severe obsessive compulsive disorder (OCD) and anxiety disorder. Looking back, Jessica remembers the ritualistic behaviors she developed as a young child. She would recite prayers over and over again until they were perfect, otherwise she feared someone in her family would die. She also pulled her hair and eyebrows out and picked at her cuticles until they bled because of her nervousness. Her senior year in high school, she had her first panic attack—gasping for breath and white flashes in her vision—and called her mother, terrified. Curious about her illness, Jessica studied psychology in college. She started weekly therapy there, and while she feels much more in control of her anxiety and OCD today, she still sees a therapist every month to keep it in check. She wants others dealing with mental illness to know that even when you can’t see a way out, there is one. Don’t be afraid to step forward. Tell someone you need help.